You sit there, watching the world start to wake as you sip your coffee watching the sunrise. There's just something about that perfect view, from the perfect window seat. A window seat that was able to be crafted because of the bay window that was rebuilt and re-installed bigger and better thanks to Elkhart Windows. So what is a bay window by definition? Technically speaking, "bay window" is a generic term for a "protruding window construction," regardless of its size. But it should be noted that though a bay window is a larger paned window, with the option of having some of those panes opening order to let in a breeze; they do come in some standard sizes. These sizes include 90, 135 and 150 degrees. And when two are put together to form a triangular "bay" this then becomes a 120-degree window. By being able to create a window of virtually any size, you are able to allow as much sunshine into your home as possible. It is also possible to then construct the before mentioned window seat from which to enjoy that morning cuppa joe. Because bay windows are designed to allow for a larger amount of sunlight and fresh air to come in, they will also need more care to install, repair or replace. Which is why the experienced staff at Elkhart Windows is there to make sure everything is completed to perfection. We also boast supplies, materials, and windows from the Home Depot, and Lowes and they will provide bay window pricing for your project. 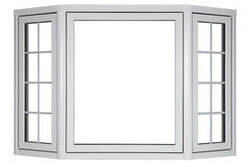 Another thing to consider when looking at putting in a bay window is the option to install a bow window. the difference being, a bay window has three openings and is available in angled projections. Whereas a bow window usually has four or five. On top of having a few extra openings, a bow window is styled differently than ay window. A bay window's overall structure consists of a picture window with two other windows, often on the smaller side of things, and they flank the larger middle pane of glass. A bow window's design is much the same, but the structure of it is curved, creating a rounded appearance on the outside of the home. By choosing a bay window for a living room, or kitchen you will be able to create a lot of natural sunlight along with an excellent way to let in a wonderful breeze. The added sunlight will not only brighten your mood, even in the greyer months, but it will also save on your energy bill since your home will be naturally heated by the sun, rather than the cost of your gas or electric furnace. From windows to installation, to cost assessments and more, Elkhart Windows has everything you need. And though it can be a little intimidating trusting such a large project to someone else, they want to assure you that they have decades of experience in the area of window installation. they also know how much your home means to you and they want to assure you that your home is as important to them as it is to you. So when that next window repair, installation or replacement comes up - contact the experts at Elkhart Windows.